to discover the region in an ecologic way. It makes cycling a real pleasure even if you are not very trained. Nice, Antibes, Cannes, Vence, Saint Raphaël or Saint Tropez : so many places that evoke the French Riviera. The sea and the sun of Provence, but also the unspoilt beauty of the hilltop villages of the backcountry, parks and rich Mediterranean gardens, and an exceptional series of museums in a region that has always loved painters. This can be done nearly all year long. 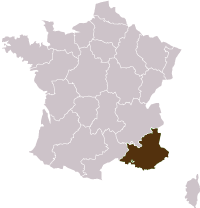 2 route suggestions to connect Vence and Grasse. • One goes through the hills : Le col de Vence (970m) and the beautiful village of Gourdon (61km, +1880m going uphill and -1660m down hill) One goes down to St Paul de Vence, and up through the “Gorges du Loup”, to reach La Colle sur Loup, and get to Grasse and Cabris. (42km,26 miles +970m going up hill, and -740m down hill) Rides on roads with moderate traffic. Night in Cabris, beautiful hilltop village, 3*** hotel, B&B. 2 routes to connect Cabris and Cannes. The longer one, but beautiful, goes first across the hilltop villages of St Césaire sur Siagne, Callian and Montauroux, to join the second lap to croos “Le taneron “ (67km + 1680m going up hill and -2200m down hill). Then a nice road across the “Massif du Taneron”, offering a beautiful view over the bay of Cannes. (41km +850m going up hill and, -1350m down hill) Rides on small roads, with little traffic except between La Napoule and Cannes. Night in the center of Cannes, 3*** hotel, B&B. This lap, with no hill climbing, takes place in very busy urban areas, but almost entirely using the seafront bike path. 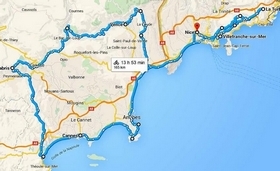 39km using the shortest route and 46 km by Le Cap d’Antibes. (+/-230m) TO DISCOVER : • Picasso Museum in Antibes. • Fernand Leger museum in Biot (+4km). • Eden Roc Villa and Gardens, Cap d’Antibes. • La Promenade des Anglais and the Port, in Nice. • The Cocteau Chapel in Villefranche. Night in Villefranche, 2** hotel , B&B. Choose your dates, enter your identity, and follow the instructions. Within 48h we will give you a confirmation invoice by e-mail. .Short steps, leaving time to visit museums, gardens.